With ArcGIS Pro, you can create maps and scenes by adding data from your own computer, from a local network, or from a project or map package. You can also add data from your ArcGIS Online or ArcGIS Enterprise portal, or another portal such as the Living Atlas of the World. In this tutorial, you'll add data from Living Atlas, from your project geodatabase, and from a folder connection. You'll view the impact of potential flooding in Wellington, New Zealand, using a 2D map and a 3D scene. Your data will include hillshade and slope layers to show relief, neighborhood boundaries and buildings, and a layer showing the area susceptible to flooding in an extreme weather event. At the top of the dialog box, in the Search box, type Add data to a project tutorial and press Enter. In the list of search results, click Add data to a project to select the project package. 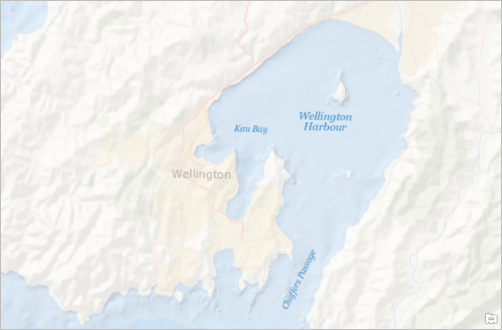 The project opens with a map centered on Wellington, New Zealand. The project also contains a local 3D scene. 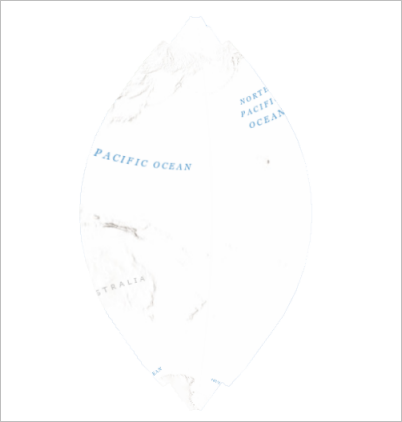 The basemap layer in the Wellington map is the World Ocean basemap. It shows topographic relief for land areas at a generalized level. A relief layer with higher resolution would make it easier to see the impact of potential flooding. In addition, a more detailed layer of place names would add context to the local geography. You can find map layers to meet many of your needs in the ArcGIS Living Atlas of the World, a curated collection of global geographic information. Maps and layers from the Living Atlas can be added directly to ArcGIS Pro. To access the Living Atlas, you must be signed in to ArcGIS Pro through an ArcGIS Online portal. 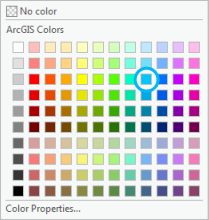 The name of your portal appears in the upper right corner of the ArcGIS Pro window. If you are signed in through an ArcGIS Enterprise portal, you will be able to access the Living Atlas only if your administrator has enabled access. For more information, see Manage portal connections from ArcGIS Pro in the ArcGIS Pro help and Configure Living Atlas content in the ArcGIS Enterprise help. At the top of the Catalog pane, click the Portal tab. Click the Living Atlas tab . 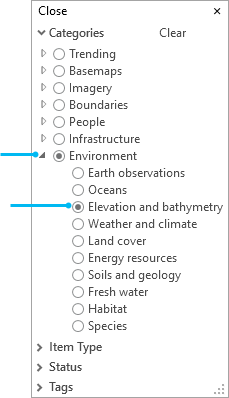 Click the Categories drop-down menu and browse to Environment > Elevation and bathymetry. In the Catalog pane, the list of Living Atlas items is filtered to show maps and layers related to elevation. In the search box, type world hillshade tile and press Enter. The layer should appear at the top of the search results. In the search results, hover over the World Hillshade tile layer . A ScreenTip displays a thumbnail image of the layer and other metadata. Right-click the World Hillshade tile layer and click Add To Current Map . By default, the map zooms to the extent of the new layer, which covers the whole world. However, the extent is constrained by the local New Zealand map projection that has been set for the map. On the ribbon, click the Map tab if necessary. In the Navigate group, click the Previous Extent button to return to Wellington. In the Contents pane, drag the World Hillshade layer beneath the World Ocean Base layer. Partial transparency has been applied to the World Ocean Base layer, so the World Hillshade layer shows through it. You can turn the World Hillshade layer off and on in the Contents pane to see the difference in terrain detail. In the Catalog pane, click the Categories drop-down menu again and browse to Boundaries > Administrative. In the search box, type world boundaries alternate and press Enter. In the search results, right-click the World Boundaries and Places Alternate tile layer (not the World Boundaries and Places layer), and click Add To Current Map . In the Contents pane, right-click the World Ocean Reference layer and click Remove . Now you have just one layer of place names in the map. In the Contents pane, click the World_Boundaries_and_Places_Alternate layer to select it. On the ribbon, under Layer, click the Appearance tab. In the Effects group, set the Layer Transparency slider to 25%. At very large map scales, the place names are not necessary. You'll set a visibility range so the layer doesn't display when you zoom in beyond a specified scale. In the Visibility Range group, click the drop-down menu next to In Beyond and click 1:24,000. The place names won't display when you zoom in closer than 1:24,000. If you don't have this value in your drop-down list, you can type it directly into the input box. Every ArcGIS Pro project has a project geodatabase, which is the default location for storing your project's spatial data. 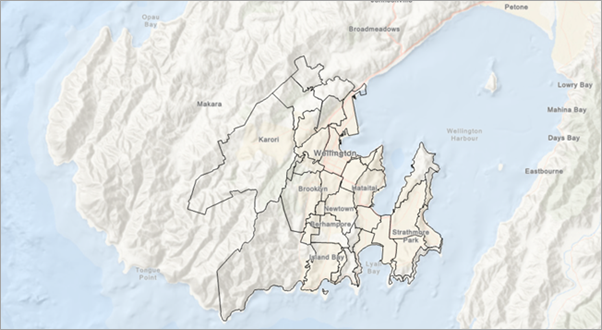 You'll browse to the project geodatabase and add data to the Wellington map. In the Catalog pane, click the Project tab. Browse to Databases > Add_data_to_a_project.gdb. The project geodatabase contains two feature classes: Buildings and Suburbs. It also contains a raster dataset named slope. You'll add the Suburbs data now. Right-click Suburbs and click Add To Current Map . You can also drag and drop the layer from the Catalog pane. In the Contents pane, drag the Suburbs layer under the World_Boundaries_and_Places_Alternate layer. Right-click the Suburbs layer and click Zoom To Layer . The Suburbs layer has a solid fill color that prevents you from seeing the basemap under it. You'll change the symbol fill color and outline. In the Contents pane, right-click the Suburbs layer and click Symbology . The Symbology pane appears. At the top of the pane, the Primary symbology tab is selected. The primary symbology method is Single Symbol, which means that all features in the layer have the same symbol. In the Symbology pane, click the symbol patch for the layer. The pane changes to show symbol formatting options. At the top of the pane, the Gallery tab allows you to choose predefined symbols. The Properties tab allows you to change symbol properties. In the Symbology pane, under Format Polygon Symbol, click the Properties tab. On the Symbol tab , under Appearance, click the Color drop-down arrow and click No Color. Change the Outline color to Black. At the bottom of the pane, click Apply. To learn more about symbology, try the Symbolize map layers quick-start tutorial. An ArcGIS Pro project may include datasets that aren't stored within the project geodatabase. 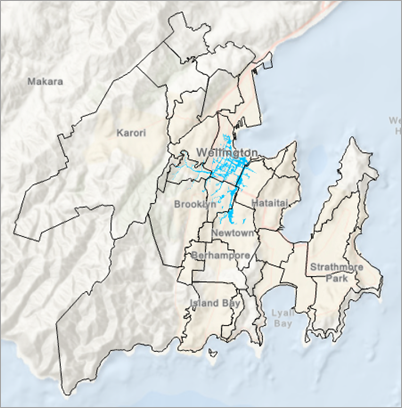 For example, this project includes a shapefile representing the flood risk zone for Wellington. A shapefile, like a geodatabase, is a spatial data format for storing feature classes. Typically, when you access data from a location on your computer or a local network, you connect to a folder. However, in this case, the shapefile is part of the project package and the folder connection already exists. In the Catalog pane, browse to Folders > Add_data_to_a_project_1 > commondata > userdata. 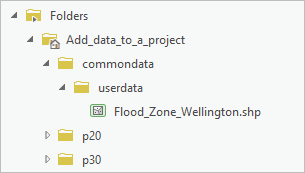 The userdata folder contains a shapefile named Flood_Zone_Wellington.shp. Right-click Flood_Zone_Wellington.shp and click Add To Current Map . In the Contents pane, drag the Flood_Zone_Wellington layer under the Suburbs layer. In the Contents pane, click the symbol patch for the Flood_Zone_Wellington layer. Clicking a symbol in the Contents pane opens the Symbology pane directly to its symbol formatting options. In the Symbology pane, under Format Polygon Symbol, click the Properties tab if necessary. On the Symbol tab , under Appearance, change the Color to Big Sky Blue. Change the Outline width to 0 pt and press Enter. Click Apply. The map shows that most of the flood risk zone lies within one suburb. In the Contents pane, right-click the Flood_Zone_Wellington layer and click Zoom To Layer . The place names from the World_Boundaries_and_Places_Alternate layer no longer display because the map scale is larger than 1:24,000. If your map scale is smaller than 1:24,000, zoom in closer. Click the Map tab on the ribbon. In the Navigate group, click the Fixed Zoom In button as needed. On the map, click the suburb containing most of the flood risk zone. A pop-up identifies the suburb as Te Aro. You'll look at the data in a 3D scene to visualize the potential impact of flooding in the Te Aro suburb. The 3D scene in the project already contains a topographic basemap and a layer of buildings. You'll copy and paste the flood zone layer from the map. You'll also add a slope dataset from the project geodatabase. In the Contents pane, right-click the Flood_Zone_Wellington layer and click Copy . Click the Wellington 3D view tab to make the scene active. 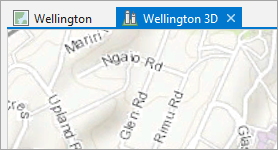 In the Contents pane, under Drawing Order, right-click the Wellington 3D scene name and click Paste . The layer is added to the scene. You'll add the slope data to get a better sense of how water flows and accumulates in the flood risk zone. In the Catalog pane, browse to Databases > Add_data_to_a_project.gdb. Click the slope raster dataset to select it. Drag and drop the slope dataset onto the scene. The default layer symbology is a black-to-white color scheme. You'll change it to a conventional color scheme for slope. In the Contents pane, click the symbol patch (the black-to-white color scheme) for the slope layer. In the Symbology pane, click the Color scheme drop-down arrow. At the bottom of the drop-down list, check the Show names box. Names appear above their associated color schemes. Find the Slope color scheme (bright green to bright red) and click it. The symbology is applied to the layer. The project contains two bookmarks to help you explore the potential flood zone in the Te Aro suburb. On the ribbon, click the Map tab if necessary. In the Navigate group, click Bookmarks . Under Wellington 3D Bookmarks, click Flood View 1. The scene zooms to the bookmark. In the lower-left corner of the view, the on-screen navigator shows that your view is facing south-southeast. It looks like a flood would affect most of the buildings in the foreground of the view. Click Bookmarks again and click Flood View 2. This view shows how flood water may flow through the landscape at the eastern end of the suburb. Use the Explore tool on the Map tab or the on-screen navigator to continue exploring the suburb. You may want to create new bookmarks at locations where flooding may cause additional damage. For many projects, you'll need to search for relevant data to complete your mapping and analysis. 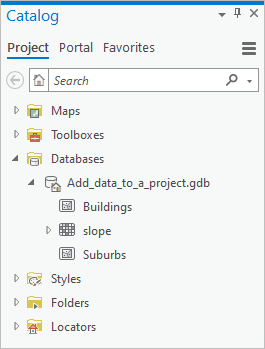 In addition to the ArcGIS Living Atlas of the World, you can use the All Portal tab in the Catalog pane to search for maps and layers shared to ArcGIS Online. You can also use ArcGIS Open Data to find open-access data from thousands of organizations that share their authoritative data.